Prime Minister Shinzo Abe said Monday this year is the right time to “take a historic step” in rewriting the war-renouncing Constitution, two days ahead of the public holiday that commemorates its entry into force 70 years ago. Abe cited the “security situation, which is increasing in severity,” as one reason for amending the foundational document for the first time since Japan lost the war. 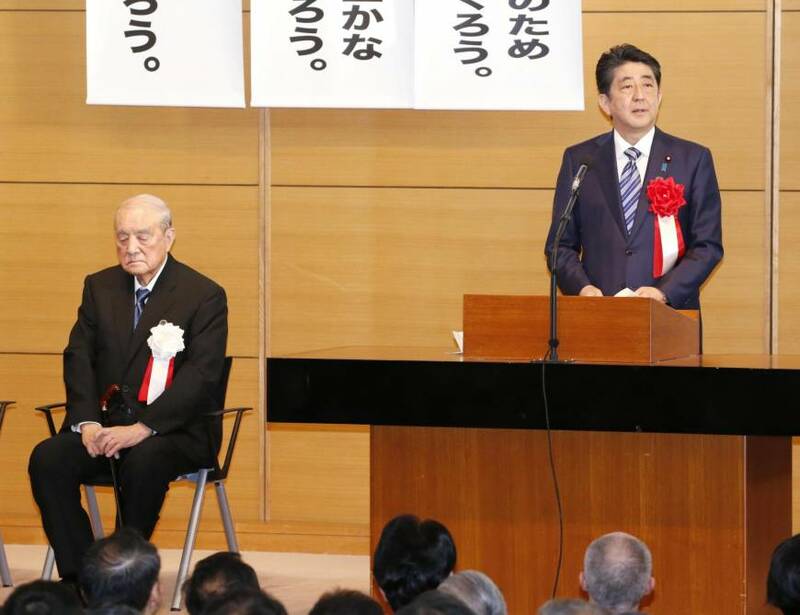 “This is the time to show the public our specific stance on the ideal Constitution,” Abe said at a Tokyo gathering of a cross-party league of lawmakers seeking constitutional reform. 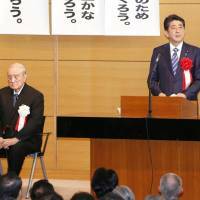 “In this milestone year, we will take a historic step toward the large goal of constitutional reform,” Abe said. “Those members of the public who think of the Constitution as an immortal tome are now a small minority,” he claimed. Any proposal to amend the Constitution requires the support of at least two-thirds of the lawmakers in both houses of the Diet to kick off a national referendum, and a simple majority in the referendum vote to pass. Abe’s main target is Article 9, which limits Japan to using force strictly for self-defensive purposes and outlaws it from maintaining a formal military and waging war. Abe’s ruling coalition already has the two-thirds majority needed when combined with pro-amendment opposition parties, but public sensitivity over changing the Constitution — especially war-renouncing Article 9 — is likely to drive them to reach some sort of consensus with the rest of the Diet. “The time is ripe. What we are seeking is a specific plan,” Abe said. Abe’s speech came amid heightened tensions with North Korea, which continues to test ballistic missiles in violation of a United Nation’s ban and is thought to be planning a sixth nuclear test.